Walking into an upper room in a 200 year old church in Cape Town, the anticipation for what the Lord was going to do was almost tangible. The excitement in the room seemed to grow with every man that walked through the doors into the old chapel where David Livingstone once stood in the pulpit. Brown paper bags filled with books gifted by a US church bearing a small Africa logo lined one wall, and around 20 chairs set up facing the front where the same logo was projected. Shepherd School has begun. A first in South Africa, the Shepherd School aims to train up a new generation of leaders and church planters to be used on the frontlines as the Lord’s kingdom continues to advance into Southern Africa. When I first heard about this new endeavour every part of me desired to be a part of it, to be united with other men, from a variety of backgrounds and churches, who share a vision for God’s glory and the furtherance of His kingdom, as we have a vision and a focus for our country right now. “This is a Nehemiah moment,” one of the participants remarked. Another man said “it feels like we are standing on the edge of something”. And to borrow the words of an old newspaper article about that great revival that swept through Wales, it feels like a cloud the size of a man’s hand is beginning to rise over Cape Town. What stood out more than any personal ambitions or callings, more than any private word from God, more than any thought of “how can God use me,” was the overarching reality that in that small, hot chapel, God has prepared 20 men and bound them together in a unity of His Spirit and a singleness of vision for His work. As we stand together in this season ahead, we are not competitors, we are not associates, we are not colleagues, but we are brothers in Christ. This is an opportunity to come alongside one another, learn from each other, encourage growth in each other, push each other forward, to pray for each other, and together move forward in faith. There is a great desire that men would connect together from different churches as a team and go out. It has been a beautiful thing to behold as already Jesus has begun to confirm callings, refine, sanctify and consecrate lives, and impart visions for the path ahead. Hearing how two brothers already have plans to plant a church this year fills me to the brim with excitement and makes my soul cry: “YES JESUS!” That another brother has heard the Lord call and is beginning to answer, and another has moved from fear to excitement, is a testimony of both God’s grace and might. I look forward to the journey ahead as we begin to hear more from the Lord, form closer bonds and actually begin to take those steps of faith. Please pray for us as we step onto that front line of battle, pray for clarity of our calls, pray for a clear vision and pray for a unity that is centred on Christ. 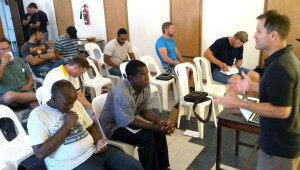 *Matthew is taking part in the first Shepherd School in South Africa along with around 20 other men from the local churches in South Africa.